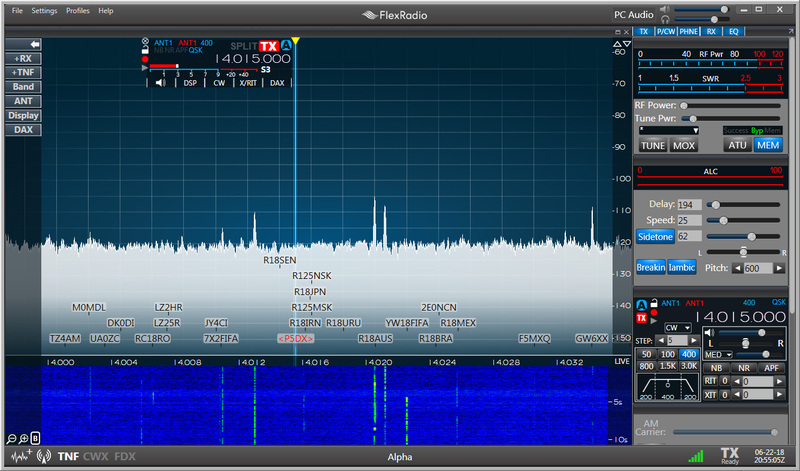 Version 13.6.5 of Commander, the transceiver control component of the freeware DXLab Suite, can display active DX callsigns on SmartSDR version 2.3.4 (and later), color coded for "need" towards the DXCC, IOTA, Marathon, VUCC, WAS, WAZ, and WPX awards on the bands and modes you specify. I have tested with my 6500, but would appreciate feedback from SmartSDR alpha testers. Here's a screenshot. I wish this function was built in to SSDR. I had a SunSDR2Pro for a week (returned it for a refund), powered by ExpertSDR, which does have this capability and it was quite nice. Besides DXLab, are there any other plug-in apps which provide this feature? There will be more. Details to be announced when the new version of SmartSDR is released. Will be released when everything is 100% correct. You should know by now if you follow this forum that there is Never a Flex Radio promised date for release as it depends on the progress of the testing. Plus if you have ever been involved in software development, it always takes longer to get it right than even the most pessimistic estimates. Spots are coming in V2.3 SSDR They were shown at Dayton. Still in Alpha testing Will be released when everything is 100% correct. Never a promised date for release. As it depends on the progress of the testing. This is being prototyped with the Alpha team. I suggest you contact Steve Hicks for the latest official status. Alpha Testers are under NDA from not discussing software features on a public forum. I really appreciate and enjoy DXLabs for daily use. Thank you! @Mack W4AX I cleared this with Eric KE5DTO and Steve N5AC beforehand. Tnx to all for the encouragement; when possible, feedback will be greatly appreciated. Dave, so cool, but it is not working, no call signs in the Panafall. Hi Steve: If you read very closely, this starts with the NEXT version of SmartSDR software that is not yet released for download. That looks really good - might even tempt me away from my anan 7000 and back to a 6600! Dx suite in daily use here as my main logging program with the anan and an ft817nd on 2m. Noticed that your screen shot was taken at a time when I was running fifa football sp call gw6xx on 14033 with just 100w to a spiderbeam with 3 wire eles on 20m. Nice to see my low power signal was reaching you. Keep up the great work. The first sentence of the announcement that started this thread makes clear that only SmartSDR 2.3.4 or later can display callsigns. I don't think it's necessary for every subsequent SmartSDR reference to restate this constraint, but if I could still edit the comment to which you're referring, I would do so. Dave, thanks for your software. If you're ever in my part of Texas, dinners is on me. I found the appropriate buttons (I think) in Commander. I'm guessing we will need SpotCollector running for this to work, whenever 2.3.4 is released? Yes, Tom, you'll need SpotCollector running. There's only one box to check: the "Display calls on panadaptor" box on the Bandspread tab of Commander's Configuration window. Can it display the call sign of other signals (SSB, RTTY)? SmartSDR 2.3.4 is working well on my 6500. How do I Configure SpotCollector and or SmartSDR v 2.3.7.110 ? For those who cant wait, Slice Master 6000 can already display spots on top of a "popped out" panafall. So any SSDR v2.X will do. Color and "needed status" from Spot Collector are shown in the display. Of course it does mean installing yet another third party application. Nobody ever said that being on the leading edge came without a price. Let me add a little less ambiguity to the timing of the release. it will be "soon". If you have followed my previous announcements, you should know that "soon" is in fact, soon. Be patient. It wasn't just me. It takes a village of developers, alpha testers and support to bring a release together.